"Hotel style amenities in a hip, happening location." 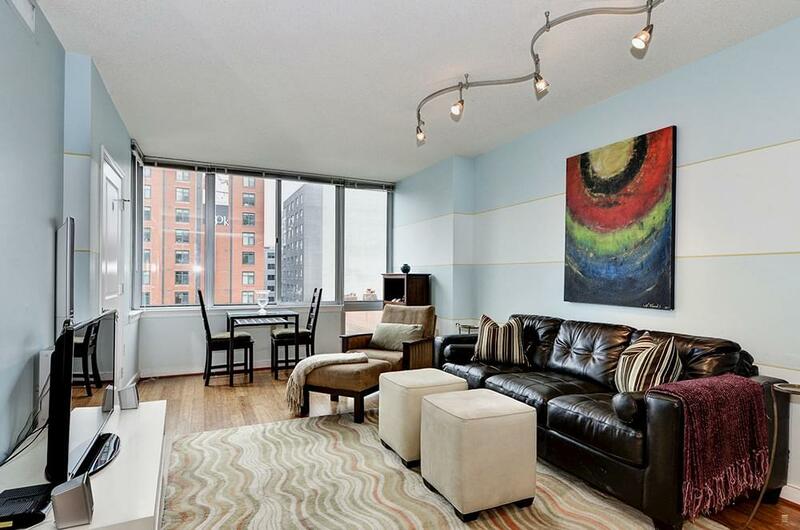 Greet the morning dawn in this sun-filled eastern unit on the sixth floor of 555 Mass. The open floor plan thoughtfully places every convenience at your service — a full complement of stainless steel appliances and granite counters, walk-in closets, blinds and shades, hardwood floors...everything you need is waiting for you. Your pets will enjoy the comforts too. Beyond the walls of your condo, the 555 Massachusetts experience continues in a building and neighborhood with exceptional amenities shared by all residents. This thoughtfully designed building offers every comfort and amenity to you and your neighbors. Luxury appointments include a staffed front desk, rooftop pool and grilling area, well-equipped fitness facility, library, large club room with fireplace and bar, garage parking and extra storage. The secure garage contains your own private space which conveys..
555 Mass is located in vibrant Mount Vernon and directly adjacent to Chinatown. Just steps from renowned restaurants, boutiques and more, this is truly convenience at its best. Bustling by day and lively by night, the area is sought-after for its proximity to the White House, Capitol Hill, The National Mall, parks and the nation's foremost cultural and educational centers. Mount Vernon Triangle combines retail, financial services, spas and fitness, hardware, supermarkets and home furnishings into its small urban footprint, with more on the way. A Safeway is a recent addition to the neighborhood, as is 5th Street Ace Hardware in City Vista. For dining and nightlife, you’ll find many temptations including Busboys and Poets,Taylor’s Gourmet Deli, Buddha Bar, Chipotle Mexican Grill and more. Metro service is conveniently located at the Mt. Vernon-Convention Center station along the Green and Yellow lines and also in nearby Chinatown at the Gallery Place-Chinatown station served by the Green, Yellow and Red lines. And Uber is always at your call. Talk with Jeff Wilson to put this powerful resource to work for you. Click any of the images below to view more Life At The Top properties.